Bookmarks are accessible at the top of every pane. Clicking on the Bookmark icon brings up the Bookmark Menu with options to bookmark the current pane, edit the existing bookmarks, and load any existing bookmarks. Bookmarking the current network location can be done via the menu or or in the Bookmarks Dialog. A bookmark is a reference to a location within the network hierarchy of a TouchDesigner project. By bookmarking a location, it's possible to jump to that location quickly without having to navigate up and down the network each time. Bookmarks for a project are saved so that they are accessible each time the project is re-opened in TouchDesigner. Bookmarks are saved as bookmark components in /local/bookmarks. Bookmarks can be recalled at any time using the Bookmark Menu. The bookmarks are listed at the bottom of this menu. To load a bookmark, click on its name and the bookmark's path will be loaded into the pane. The Bookmark menu is accessible at the top of every Pane. Clicking on the Bookmark icon in the Pane Bar opens the menu. Below the Bookmark titlebar, there are buttons to Bookmark this Pane and to Edit Bookmarks... using the Bookmarks Dialog. Bookmarking the current network location can be done by clicking the Bookmark this Pane button. 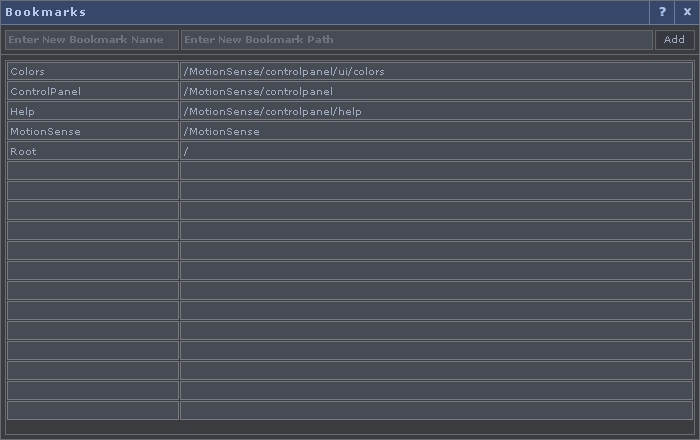 When this is clicked, a dialog opens showing the path the bookmark will save and a default name. These can be edited here, and accepted by pressing Done in this dialog. Press Cancel to escape. Clicking the Edit Bookmarks... button will open the Bookmarks dialog. The bookmarks are listed (in alphabetical order at this time). By clicking on the name of the bookmark, the bookmark's path will be loaded into that pane. Bookmarks can be added, edited, and deleted using the Bookmarks Dialog. Select Edit Bookmarks... from the Bookmark Menu, or select Bookmarks... from the Dialogs menu, or use the Alt-b shortcut. This page was last edited on 6 March 2018, at 22:53.